AirDrop is the extremely easy local peer-to-peer file transfer tool that is built into OS X 10.7 and 10.8 and beyond, it allows you to easily send and receive files wirelessly over a network just by dragging and dropping. It’s a great addition to Lion, but it’s not supported on all Macs (some 2008 model MacBook, MacBook Pros, some Mac Pro’s and Mini’s, etc), and most Hackintosh setups also can’t access it… and you can’t use it over Ethernet… until now. You can enable AirDrop with Ethernet and enable AirDrop Wi-Fi support on technically unsupported Macs running OS X 10.7 Lion, Mountain Lion, or later by using a simple defaults write command in the Terminal. It’s a fairly easy procedure, and we’ll walk you through it. You can also reboot the Mac for changes to take effect. Keep in mind that you will need at least one other Mac in the same region in order to use AirDrop. If you’re totally new to the feature, check out our quick guide that covers how to quickly and easily share files with the AirDrop protocol, it’s really one of the fastest ways to share files between Macs and is well worth using. Same as before, you will need to relaunch Finder for the changes to take effect and have AirDrop disabled again. With how easy this is to enable, it makes you wonder why it was left off of some older Mac models to begin with, and why it’s not enabled for Ethernet connections either. This tip comes from a user submission to MacWorld, and attached is a note that you may need to use this command on all Macs that intend to interact with the unsupported Mac, although that doesn’t seem to be the case on all machines. Don’t forget that you can also change the AirDrop sound effect too. No. You must manually share folders on the PC, connect with Ethernet cable directly, manually set IP address for each computer. Use the “LAN Sync” option in Dropbox’s preferences. Did you restart the Finder and/or reboot the unsupported MacBook Pro? Put the defaults write command on both Macs? It should work. You will have to run the command on every computer, even the newer one. Once I did that, and restarted Finder, I was able to see the older computer from newer one. Also, you don’t have to reboot computer. just restart finder. Works on the tonyMacX Hackintosh build, excellent tip! I can verify that. Works fine on my Core i7 Hackintosh. I have a MBA 2011 and iMac 2007. I use TimeCapsule 2011 as router. Issued the command in terminal on both machines. I copy pasted the command line into terminal and rebooted but no go for me on my 2006 intel iMac. Any other advice by someone knowledgeable will be happily tried. no go for me either. I have a 2008 macbook pro (pre unibody) and it doesn’t work for me. once you enter the command, you have to go to the apple logo on top, go to force quit, and then relaunch finder, then restart. Also tested this out with quite a few older macs, works great! However on new macs, you have to run the same command line in order for them all to work in harmony. Excellent tip, works with 2006(I think) white Core2duo iMac and 2009 aluminium Macbook. Airdrop just appeared on the iMac’s finder, where none existed before. Remember to select Airdrop on both machines …. The tip is “for user”. As I taught it is “system wide”, I typed the cmd lines prefixed by a “sudo”… But it wasn’t ok. I retried to type the cmd like said (copy/paste)… and it work like a charm (no need to reboot with the killall). Airdrop is know available on my wireless-less mac…. but I still don’t see my macbookair (finder opened on airdrop section on both) -> on the same network. What about the nic firmware??? Worked for me on my 08? iMac Core 2 Duo 10.7.1. Haven’t checked if I also need to do it on my 2011 Macbook Pro for it to interact with the iMac. Worked for me on my late 2006 iMac (connected via ethernet) and early 2008 MacBook (connected via AirPort). Brilliant tip! This works on a Macbook and a iMac that was Unsupported. I put this on my 2007 MacBook Pro (2.16GHz Core 2 Duo) and it worked fine in the Admin account, but I had to do this separately for a user account. Fine there too once done. Like others, I also used Force Quit via the Apple menu. Excellent tip: thanks for passing it on. i can’t believe it worked for me too on my old MacBook and iMac (both intel Core 2 Duo, though)! since it’s my first time using Airdrop, is there anyway to change the default drop location to the Desktop rather than the Downloads folder where it’s currently going? great tips. works like a charm..thank you. I have two early 2009 Mac minis and a mid 2009 15″ Mac Book Pro. I did exactly as it said in the tip on all the Macs – first the default network change, then the Finder restart (I used Force quit on one and killall on the other two, just for the hell of it). Thanks for the code! I was looking everywhere for a solution. Thank you so much! Yes, it works flawlessly. I have an early 2008 white MacBook I recently upgraded to Lion, and I almost didn’t update because the lack of features for older computers, but I’m closing as many gaps as I can! Works a treat for me, from my wired-in iMac to my wireless Macbook. Just what I needed. What’s the catch? Why isn’t this an option from the System Preferences, for example? It worked the very first time from my wired 2007 iMac (unsupported) to my white macbook (supported), but only from the iMac to the macbook, the iMac never showed up in airdrop on the macbook. Now, the macbook doesn’t even show up at all. I did the command on both computers. AAAHHHHHH. Great tip! Worked on my early 2008 MacBook. Have tried to both send and receive files, and it’s all systems go. Thank you! Worked with a 2008 PowerMac and 2010 MBP. Had to run the command and force quit Finder on both machines. It is works! Great! But now I have a problem with general internet over wifi. It is not working now. When I disabling this function general internet over wifi it becomes working! I’m using an early 2008 Mac Pro 3,1 with Ethernet as my only internet access point. Thanks for this! Worked great on my older model MBP and Desktop MacPro! Thank you so much for this tip! I’ve been upset about my Early 2008 Macbook not having airdrop since the day I downloaded it last summer. You guys are the best. but for me it fits! Thank you so much, one of the best tips i’ve read in awhile. Now to transfer files to my new imac 27 when in comes in! This is fantastic! However is there anyway to keep Airdrop constantly connected other than having to keep a finder window open with it selected? I can verify that this does work on my hackintosh core i7. Doesn’t work between os x iPad/iphone. os x os x only. Or – you can have any wi-fi device on os x. Well yes that is correct, the iPhone and iPad do not have ethernet and they are not Macs. 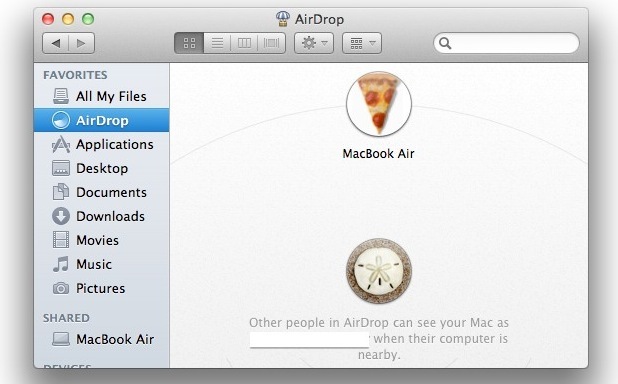 Airdrop works to send files between Mac and iOS in iOS 8 and Yosemite. “In order to transfer files between a Mac and and an iPhone, iPad or iPod touch, your iOS device needs iOS 7 or later installed and your Mac needs to be a 2012 or later model”. Works great for me thanks!!! MacPro early2008 and MacBook Pro early 2011, both Maverick..
Is there any reason for it? all devices are uptodated with the latest iOS. How do I get it working again? Your article doesn’t help. Interesting. Well considering that the iPad doesn’t have ETHERNET at all and only uses Wi-Fi and BlueTooth I would not be surprised if you don’t find this article to help with the iPad for AirDrop to a MacBook Pro. Frankly, I’m not particularly impressed with your ability to read, this is about Macs with ethernet it has nothing to do with the iPad. But for me, I need AirDrop over ethernet, and this works exactly as described for that. Maybe you should return your iPad to Apple? Get something with ethernet. Umm, yeah, bit of a douche bag reply there eh? Worked like a charm!!! Funcionó excelente!!! Thx for the tip guys!!! Mac Pro early 2008! Now I can see airdrop between this Mac Tower and my newer MacbookPro 2012! Thx!! !